This year’s Orange Shirt Day marks the fifth year students, teachers and all Canadians are invited to wear orange shirts to commemorate former students of Canada’s Indian Residential Schools. Orange Shirt Day began in 2013, when residential school survivor Phyllis Jack Webstad shared her experience of having her orange shirt confiscated on her first day of residential school. Since then this event has garnered an increasing amount of attention, with thousands of Canadians joining in to remember survivors, acknowledge the continued intergenerational trauma of residential schools, promote historical awareness, and engage in reconciliation. Phyllis Jack Webstad herself has recently published a book based on her own experiences (including the story of the orange shirt) entitled The Orange Shirt Story. Sara and Ingrid, along with Crystal and Quinn, wear orange shirts to remember residential school survivors, both those who are alive and those who have passed. Photo credit: Chris Shapka. How can we engage in Orange Shirt Day every day? When we wrote 150 Acts of Reconciliation for the Last 150 Days of Canada’s 150 last year, our goal was to engage everyday Canadians, Indigenous peoples, community organizations, educators, and businesses and encourage them to learn more about Indigenous issues in our territories. In addition to writing the #150Acts (find us on social media using this hashtag! ), we worked with Tagé Cho Hudän artist Lianne Charlie to create a poster project to feature a few of the Acts that we think are especially important. We wrote our #150Acts not only for others to engage with, but as a challenge to ourselves too. Like you, we are committed to sharing reconciliation with our families and children and Orange Shirt Day is the perfect time to have a conversation, read a story, or share an experience with a loved one. 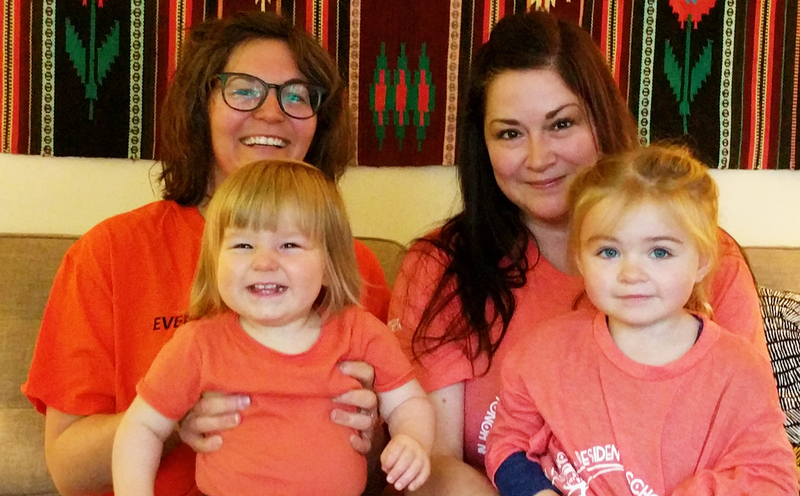 Orange Shirt Day is a day of commemoration that Canadians can participate in both their homes and workplaces. It also provides the opportunity for you to ask questions, engage in new conversations, and learn more about your neighbours! So, what do you think you can do in your everyday life? As you sport your orange shirts today, we invite you to select an act that you will engage with on your own, one that you will do with your family and friends, and one that you can do in your community or workplace. And we invite you to add new acts of your own, too! After all, our final act on the list is #150: Why stop at 150? After all, Indigenous nations are celebrating millennia on this land. Build on this list or start and share your own. #151: Support one of the many Indigenous organizations or businesses that are selling these shirts by purchasing one for each of your family members. #152: Strike up a conversation with someone else wearing an orange shirt. #153: Write to your MP in support of a national holiday to recognize the legacy of residential schools. As you take action, use the hashtags #OrangeShirtDay #EveryChildMatters and #150Acts to participate in the national conversation and publicly support former residential school students and those who are affected by intergenerational trauma. Crystal Gail Fraser is Gwichya Gwich'in and a PhD Candidate. Dr. Sara Komarnisky is a settler Canadian and anthropologist. Together, they wrote 150 Acts of Reconciliation for the Last 150 Days of Canada’s 150.